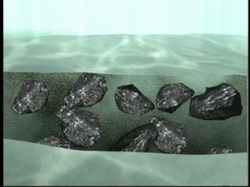 - Minerals in some rocks dissolve as the water soaks into them. - The dissolved minerals form a natural cement that sticks the larger pieces of sediment together. - This process in which pieces of sediment are held together by another material is called cementation. Watch from 0:32 - 1:02 for info on cementation.